JAKARTA - Thursday (11/14) morning, 00.23 WIB, an earthquake occurred in Klungkung Regency, Bali, with a magnitude of 5.3. The epicenter was at a depth of 20 kilometers and was 78 km southwest of Klungkung. According to the Head of the Volcanology and Geological Disaster Mitigation Center (PVMBG), the Geology Agency, Ministry of Energy and Mineral Resources (ESDM) Kasbani, the epicenter of the earthquake is associated with a subduction zone system between the Eurasian Continent Plate and the Indo-Asutralian Ocean Plate. "Based on the position and depth of the epicenter, it is associated with a system of subduction zones between the Eurasian Continent Plate and the Indo-Australian Ocean Plate," explained Kasbani. The Agung Volcano Observation Post in Rendang, Karangasem Regency, Bali reported that a shock was felt on the MMI III scale. This earthquake too, did not cause a tsunami added Kasbani. "This earthquake did not cause a tsunami, because even though the location is in the sea, there was no sea floor deformation that could trigger a tsunami," he explained. 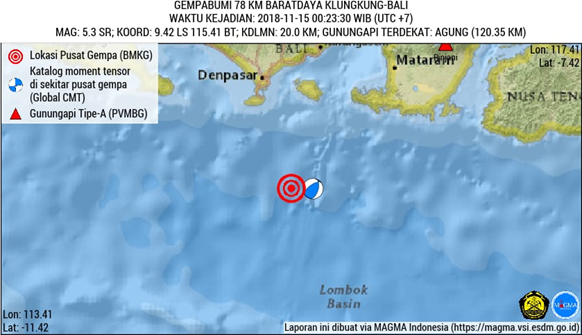 PVMBG also released that the center of this earthquake was in the sea. The closest area to the epicenter was composed of tertiary carbonate rocks and quaternary volcanic rocks. "In rocks that have undergone weathering, not yet compact and loose, will strengthen the effects of earthquake shaking so that it will be felt more," Kasbani added.